After an extensive renewal that has brought Vision of the Seas sailing into the 21st century, you’re sure to remember your first cruise on this beautiful ship for some time to come. 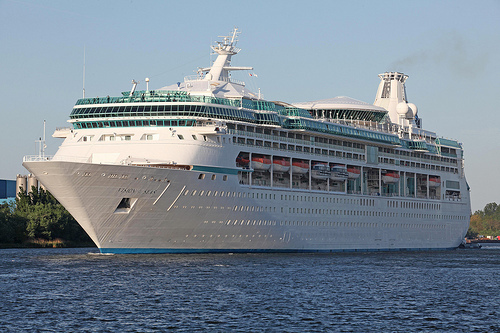 You can see all the best Vision of the Seas cruise deals here – or keep reading to find out more about what’s on board. Vision of the Seas’ recent renovation saw a number of new and exciting features brought to the ship. Amongst these are a new aerial entertainment experience and five new dining options, adding to the already impressive choice of attractions on board. An existing favourite is the Viking Crown Lounge, which offers breathtaking 360 degree views of the sea at 150 feet above the waves. You’ll want to spend plenty of time up there! If relaxation is what you’re looking for, then the Day Spa is a must-see – offering a range of health and beauty treatments. Great if you feel like being pampered! Alternatively, fitness fanatics can get their fix in the fantastic on-board Fitness Centre, with cardio equipment, weights and many other sporting facilities available. Go for a jog around the running track, or scale the heights of the rock climbing wall – it’s up to you. There’s also a range of theatre shows and performances to entertain the whole family. And when it comes to dining, you’re spoilt for choice here – from the laid-back Windjammer Cafe to fine Italian food at Giovanni’s cafe; from Izumi Asian Cuisine to the high-end Chops Grille. You need never eat the same meal twice on this ship (although you might want to!). Staterooms on Vision of the Seas are spacious and accommodating, no matter what type of room you choose. The interior staterooms may be the most basic option here, but they are still extremely comfortable and packed with nice little touches to make you feel at home. Outside staterooms combine all this with a view of the ocean. Balcony suites are the next step up, with your own private balcony to take in the sea air or appreciate the sunset. Or for the very best accommodation on board, the Deluxe Suites will cater for your every need – from luggage valet service to priority check-in and departure. Make sure you check out the latest deals on our Vision of the Seas cruise deals page. We’re always updating our pages, so if you can’t see what you’re looking for be sure to check back in a while. Or use the search tool to find out what other deals are on offer.